I've given up on finding an "edge control" product that actually works for me. Nevertheless, I somehow wound up with Hawaiian Silky Moroccan Argan Oil Hydrating Sleek Sleek Edge. Why these products have such lengthy names now, I do not know. Product Claims: Hawaiian Silky Argan Oil Hydrating Sleek Edge provides the perfect control for your edges. This non-sticky formula helps hold down edges to give you control of your style while delivering sleek shine and incredible moisture. Thoughts: Sleek Edge holds my edges for all of 30 minutes, if that. Although I can't use this product for its intended purpose, it is good at taming canopy frizz. I just smooth a small amount over the top of my hair when needed. When used on clean hair, Sleek Edge imparts a nice shine. However, it does buildup easily so this isn't a product for everyday use. I can use it 1 to 3 times between washes without there being noticeable buildup. It doesn't always mix well with other products so I test it on a small area of my hair before applying fully...a lesson learned after a few failed attempts. I hate having to wash my hair twice in the same day because of a bad product combination. The fragrance is hard to describe, but it reminds me of shampoo with a hint of amber. I don't like it, but it fades quickly enough. 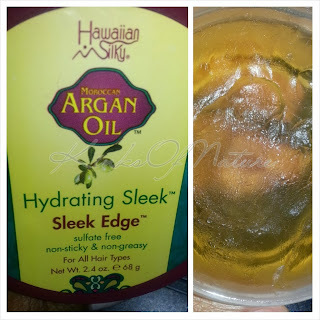 Hawaiian Silky Moroccan Argan Oil Hydrating Sleek Sleek Edge retails for ~$5 and ~£7 for 2.4 ounces. It is widely available in local brick-and-mortar stores and online. Would I repurchase? No. I've used less temperamental edge control products before that perform better than this one. 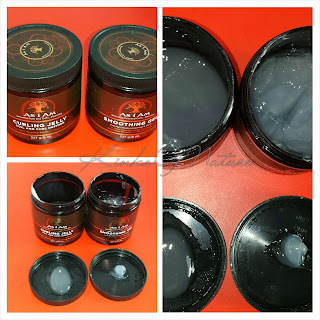 When I need lasting edge control, I can use gel.